White Sapphire and White Topaz Stacker Rings — Form Bespoke Jewellers Ltd.
Bespoke and versatile stacker rings using white sapphire and white topaz. Three individual rings make up this sparkling stacker ring set. One ring boasts a solitaire, rub set, round brilliant cut white topaz. 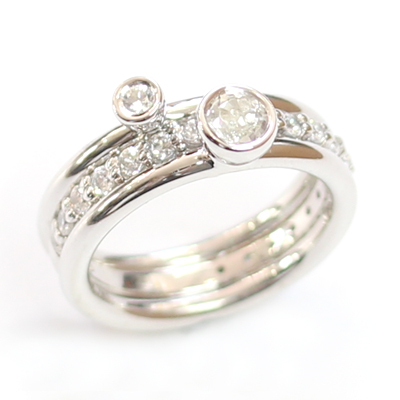 A second ring is three quarter set with small round brilliant cut diamonds for a real flash of sparkle. Then a third ring a set with a solitaire, rub set, round brilliant cut white sapphire. All three rings could be worn independently, in pairs or as a full set. Each ring sits alongside another perfectly and in various combinations. A truly beautiful, adaptable dress ring.